"Traffic being diverted to the freeway left the businesses here in more of a state of need than I think people were hoping." Because Devin Samuelson's experience with the East Central neighborhood extends only back to the late 1980s and he has owned a business there for just a year, he provides valuable perspective as a relative newcomer who does not remember what the neighborhood was like before the construction of the I-90 freeway. One of the things that attracted him most was the reasonable prices and easy availability of business properties that also offered ready access not just to downtown but, because of the freeway, to points further east and west. This was a combination that allowed entrepreneurs to road-test "incubator" ideas that would have no chance were overhead higher. He has also noted that East Central is not as dangerous as he was led to believe. To the contrary, there is a close network of business owners working together as the East Central Business Association, which has a tight relationship with the East Central Community Organization. It is a combination that one finds in only a few other parts of Spokane. Freeway construction had some negative effects, though. It is clear that while the I-90 enable growth in some places, it inhibited it in others. Before the freeway there was a lot of foot traffic in the East Central neighborhood, and there is no doubt that that diminished significantly after. Neighborhood businesses that relied on drop-in patronage fell by the wayside to be replaced by specialty stores. Although this has been a difficult transition that is still ongoing after several decades, it shows signs of stabilizing, which bodes well for the future of East Central businesses and residents alike. 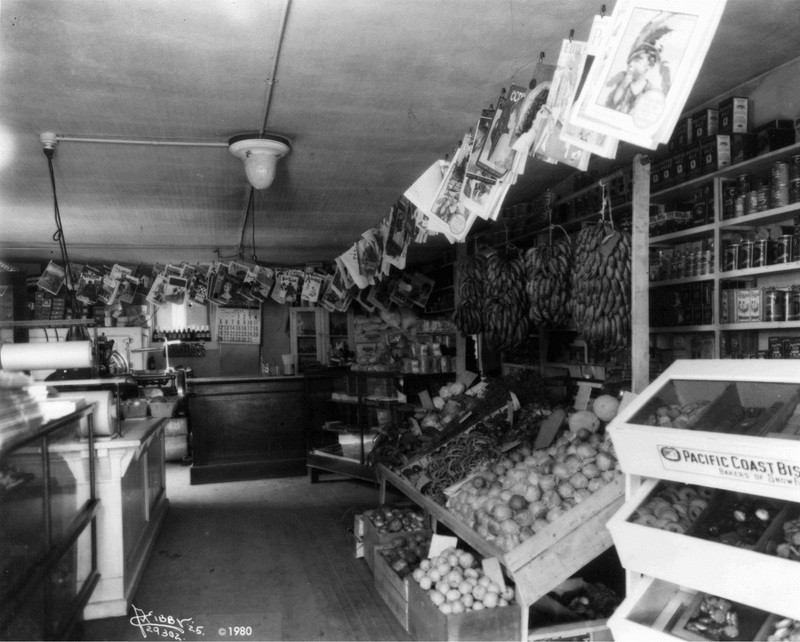 An East Central Produce Store, 1925 (image L87-1.29302-25 courtesy of the Northwest Museum of Arts and Culture): Small specialty shops like this one were common before the construction of I-90. 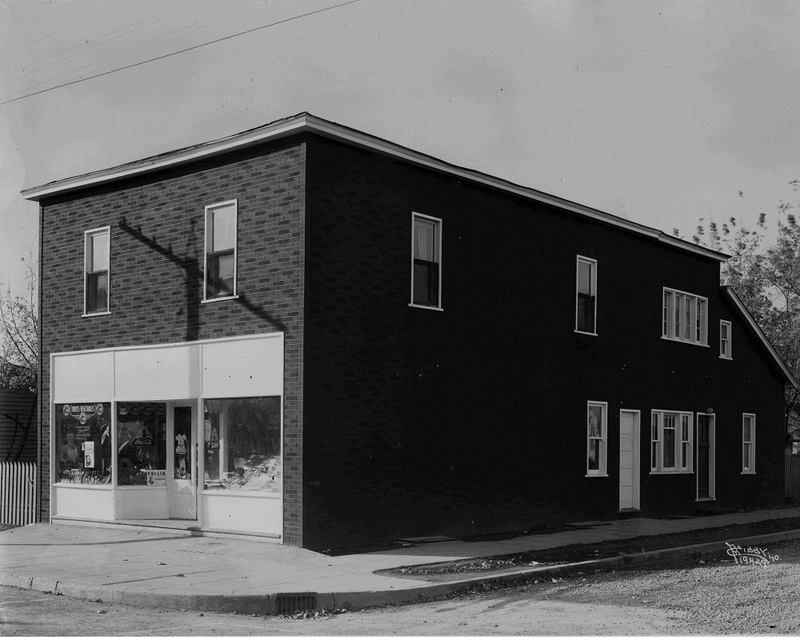 The Sheridan Grocery Store on 5th Avenue and Freya, 1940 (image L87-1.19429-40): Small general stores like this one catered to smaller sections of East Central (Sheridan, in this case). 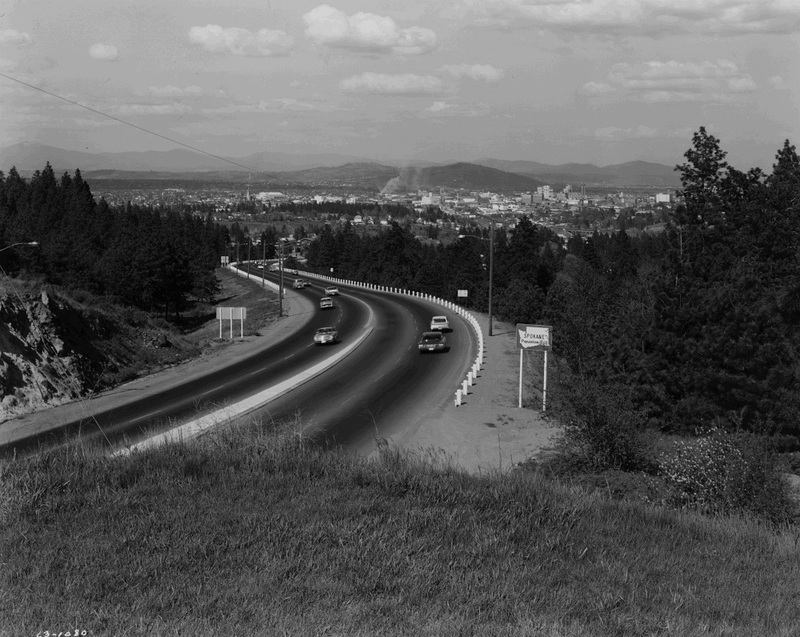 The Sunset Highway, 1963 (image L87.1-1080-63 courtesy of the Northwest Museum of Arts and Culture): The Sunset Highway (SR 10) was the main route into Spokane from the west. This picture was taken just a year or so before I-90 came through. 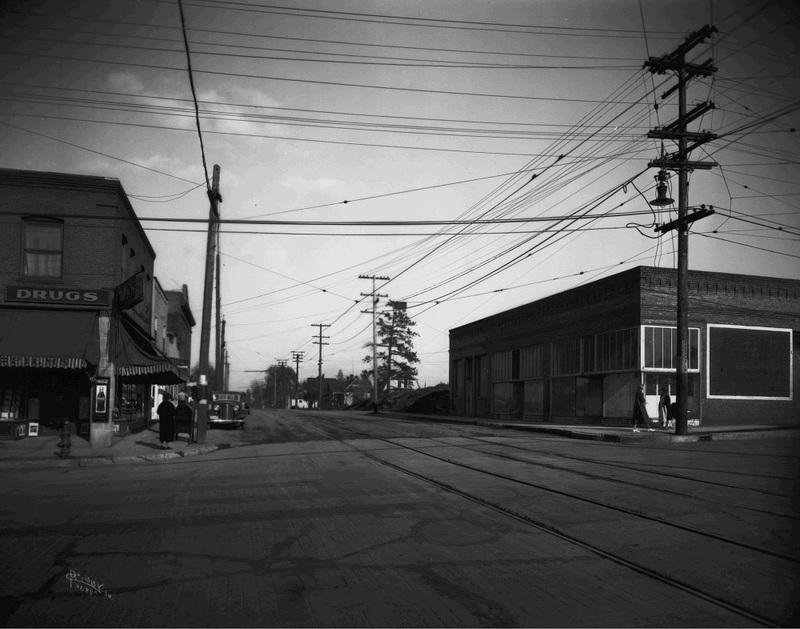 An East Central neighborhood street, 1934 (image L87-1.3688A-34 courtesy of the Northwest Museum of Arts and Culture): Before I-90, residents of the East Central neighborhood did much of their shopping in local stores like these ones. Note also the streetcar rails, which are now paved over. Spokane Regional Health District's Neighborhoods Matter Program, & Frank Oesterheld, “Devin Samuelson, Business Owner Since 2013,” Spokane Historical, accessed April 20, 2019, https://spokanehistorical.org/items/show/477. Devin Samuelson, interview conducted by Roche Strand and Josh Pittman, January 10, 2014.